According to the Reporters Without Borders ranking covering 2011 activities, Uganda has dropped from 96 to the 139th position out of 170 countries surveyed worldwide. Alleged brutality by security forces against journalists and proposed draconian legislation against newspapers have plunged Uganda 43 places lower in the latest press freedom ranking by the Paris-based Reporters Without Borders (RSF). The RSF report was released yesterday, a day after Daily Monitor photographer Isaac Kasamani was shot at by plain clothes security personnel travelling in a police van. 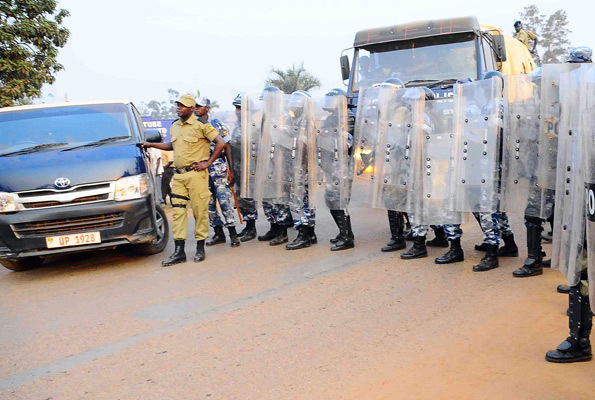 The civil society yesterday condemned the attack on the photojournalist who was covering the opposition Activists for Change rally in Kasubi, Kampala. The RSF report covering 2011 activities, said Uganda had dropped to the 139th position out of 170 countries surveyed world-wide. The Press Freedom Index notes that an increased number of journalists in Uganda reported more acts of violence meted out on them by security agencies. “Journalists in Uganda were the targets of violence and surveillance during the presidential election in February (2011) and were targeted again during the brutal crackdown on the Walk-to-Work protests later in the year, when dozens of journalists were arrested,” the report indicated. The report claims that President Museveni “launched an unprecedented crackdown on opposition movements and independent media after the elections in February”. Since April, 2011, when the Walk-to-Work protests started, several journalists and media houses have reported incidents of harassment by government officials. Ms Okurut said even when journalists are harassed, they are avenues for arbitration and legal redress. Mr Haruna Kanabi of the Independent Media Council, Uganda, echoed the report’s assertion that press freedom are deteriorating in Uganda especially for those reporting about issues of governance. “Today, a Ugandan journalist who wants to cover such stories must think twice, first about the property he carries, his or her life, and the consequence of his or her reporting,” Mr Kanabi said. He said due to narrowing press freedoms, media houses have started reporting about leisure and fashion other than governance issues as a safe zone. On Saturday, Capital FM’s Tugume was attacked and his wife beaten by armed men as he was driving with his family, according the Human Rights for Journalist-Uganda coordinator, Mr Ssebagala Wokulira.